The EU associations representing DSOs - CEDEC, EDSO for smart grids, eurelectric and GEODE - are convinced that the KORRR methodology proposal still contains several parts that conflict with EU legislation and risk the benefit of the system as a whole. Read more about the DSOs' concerns here. Hans Kreisel, President of the municipally-owned Skellefteå Kraft, Sweden's fifth largest electricity producer and the owner of a 12,000-km electricity grid spanning across nine municipalities, has been appointed as new chair of GEODE. Read more in our press release. The new GEODE brochure is available here. 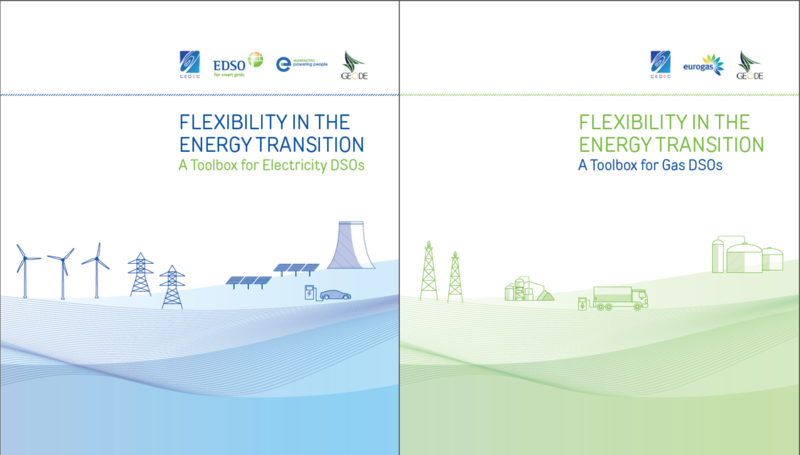 On 27 February 2018, the European associations representing electricity and gas distribution system operators (DSOs), namely CEDEC, EDSO, eurelectric, Eurogas and GEODE, presented two reports entitled “Flexibility in the Energy Transition: a Toolbox for Electricity DSOs” and “Flexibility in the Energy Transition: a Toolbox for Gas DSOs”. On 19 Februrary 2018, the European associations - EDSO, Eurelectric and GEODE - issued a joint statement expressing their support for a fair and proportional decision-making process of the EU DSO Entity. The full text of the joint statement is available here. GEODE has published its Amendments Proposals to the European Commission's Directive and Regulation on the internal market for electricity, which were both published in the 'Winter Package' in November 2016. You can read the full Amendments Proposals for the Directive here and for the Regulation here. Naiades published a report on “Recommendations for European future electricity Distribution policy”, which has received funding from the European Union’s Horizon 2020 Programme. The objective of the Naiades project is to manufacture sodium-ion batteries designed to the technical specifications drafted by Estabanell Energia, an electricity distributor and member of GEODE. The aim is to put the batteries in a secondary substation connected to both prosumers and consumers. GEODE has joined forces with partnering stakeholders across the Energy sector here in Brussels to launch the Electricification Alliance, calling to recognise electrcity as the key energy carrier for an efficent and decarbonised European future for all Citizens. The declaration was launched on 23 June at an event in Brussels. Renewable Gas in the Recast of the Renewable Energy Directive: A (Hidden) Opportunity? This statement is a brief response to the Renewable Energy Directive (RED II), and embodies the views of nine European associations representing producers, suppliers, transporters and distributors of gaseous energy coming from natural and renewable sources. We bring together a broad base of local, regional, national, and international actors promoting and raising awareness about the potential that renewable gas can offer Europeans in terms of clean, efficient, safe and sustainable energy. Brussels, 8 November 2016 - Representatives of biogas and hydrogen producers, gas infrastructure operators, gas suppliers and vehicle manufacturers released a common statement that sets out the reasons why renewable gases can play a critical role in the decarbonisation of Europe’s energy mix and then lists specific items that should be included in the revised Renewable Energy Directive (RED II). Brussels, 7 November 2016 - The European associations representing distribution system operators (DSOs), CEDEC, EDSO for Smart Grids and GEODE and the association of automotive and industrial battery manufacturers, EUROBAT call on the EU institutions to deliver a clear regulatory framework incorporating storage as a key instrument towards achieving the Energy Union. Battery energy storage is an important grid management solution that can help boost the robustness of Europe’s electricity grids. This report provides input to the European Commission in their work on identifying an appropriate TSO – DSO framework, being part of the forthcoming “Market design and Renewables package”. It aims in particular at sharing recommendations on common European principles and criteria for data and information exchanges. The drive towards a low-carbon energy future with the rise of technological innovation and changes in electricity demand poses specific challenges as well as opportunities for the distribution networks. The Distribution System Operator (DSO) as grid operator and neutral market facilitator plays a significant part in ensuring the stability of the future energy infrastructure. However, in order to address the upcoming challenges, GEODE believes that DSOs’ already existing tasks – from network operation, data management data handling to customer engagement – will evolve and include activities related to flexibility, storage and e-vehicles, without hampering market functioning. Transforming the electricity distribution grids for the future requires innovation as well as capital investments, which should be reflected in the regulatory framework for distribution system operators (DSOs) – and in particular in the design of network tariffs’ structure. GEODE has identified the following key principles: Cost reflectiveness, fairness to customers, market development and energy efficiency. With Europe reducing greenhouse gas emissions and decarbonising the transport sector, electric vehicles are becoming a significant topic on the Energy Union’s agenda. From the perspective of Distribution System Operators (DSOs) - as grid facilitators – this creates a number of opportunities and challenges. In this Fact Sheet GEODE looks at the evolving role of DSOs in e-mobility, analyses different models for building and operating charging infrastructure and puts forward some of the technical and economic challenges from a DSO perspective. The increasing integration of renewable energy sources (RES) into the distribution grid is a challenging task for Distribution System Operators (DSOs) as over 90% of RES are connected to DSO network. This creates a higher demand for local flexibility - which can be provided by decentralized energy storage,a tool for DSOs in order to manage flexibility. For making full use of the benefits energy storage can offer, the DSO needs to play an active role – which is the main focus of GEODE’s new Position Paper written by its experts from the WG Smart Grids. GEODE believes energy storage should be integrated at different levels of the electricity system including the distribution grid and at customer level. 25 Years of Looking Ahead! GEODE is turning 25 this year and celebrated the anniversary on 12 May 2016, Brussels - showing that the energy sector can be lots more fun than some might say! For commemorating GEODE’s history and achievements of the past 25 years, we brought together old and new friends across the energy community – decision-makers, stakeholders and of course our members. The history and success of GEODE is built on the enthusiasm and great efforts of our members - experts from 15 countries across Europe who have committed themselves and contributed over 25 years to shaping Europe’s policy debate making the voice of local energy companies and the networks heard in Brussels. On Tuesday, 19 April 2016, GEODE and Energy Networks Association (ENA) held an event hosted by Paul Brannen, Labour MEP for North-East England, in the European Parliament in Brussels to mark the launch of GEODE Green Gas report, "A Sustainable Europe: Green Gas, Green Grids, Green Future". The report explores the contribution which gas from renewable sources can make to low carbon heat and transport, and supporting the electricity networks in meeting the challenges of decarbonisation. It makes a number of recommendations, including setting EU wide targets for sustainable gas. GEODE welcomes MEP Werner Langen’s (EPP, Germany, ITRE Committee) draft report “Towards a new energy market design” of the European Parliament. GEODE has submitted comments to all Members of the ITRE Committee. You can access GEODE's comments here. On 18 February, the International Energy Agency (IEA) presented together with the European Commission its report "Re-powering Markets: Market design and regulation during the transition to low-carbon power systems". The launch event was chaired by Dominique Ristori, Director-General of ENER. GEODE welcomes MEP Theresa Griffin's (UK, S&D, ITRE Committee) of the European Parliament’s draft report on the New Deal for Energy Consumers. GEODE's comments to the draft reportwere distributed among the MEPs in charge of the report as well as the ITRE Committee. GEODE, the European association representing local energy companies was founded in 1991. Today - 25 years later - GEODE sees the same need to strengthen the important role local energy companies play in the energy market. Local energy companies have been serving citizens in many cases for more than 100 years, building strong a customer relationship and solid ties wth the region by constantly providing new services oportunities for its customers as well as developing a healthy competition. GEODE believes that the aspects outlined above are among many that should be taken into account while designing Europe's future energy market. On Friday, 20 November 2015, a joint letter of European power sector including 4 DSOs associations and ENTSO-E has been sent to the Executive Secretary, Mrs Figueres, and to the 196 parties to the United Nations Framework Convention on Climate Change; copied to Mr Maroš Šefčovič, Vice President for the Energy Union, European Commission and Mr Arias Cañete, Commissioner for Climate Action and Energy, European Commission. It urges them to agree on a strong climate agenda which is the very condition for a future-proof and ambitious regulatory framework able to drive the necessary public and private investment in the power sector to effectively and rapidly fight climate change. GEODE Leaflet "DSOs working closer to the Customer"
The GEODE Leaflet is a useful and compact marketing tool presenting the vital role of electricity and gas distribution grids for the energy system and hence for society as such - in particular in a smart grids environment. It also shows how local energy distributors are best positioned to cover local needs working closer to the customer. European gas and electricity networks will not become smart and the energy transition will not happen without energy distributors’ involvement!